Restraints. Act first, then order? A Judgement Call. I can see an argument for option one or two here in the absence of other information. Option three looks like it was quoted straight out of a textbook. If the nurse in this scenario chose option one, it was because the nurse had the information to justify that decision. It is hard to clearly make out what the OP is saying. Really vague IMO. I want to make assumptions based on what is missing, but I know I would tear the OP apart if I did. OP, this was your second week on your own. If you want to put this job on your resume, it will come back to haunt you if your next potential employer does enough digging. You already have two other jobs going for you. Make the best of that. From what I am getting here, I don't think you are capable of working in an environment with a faster pace. Everyone wants me to take Nursing? Only $3 between a CNA and nurse? Must be a cushy job for the nurses, otherwise, I don't see any retention. Look at CA BON's reporting policies for license revocation. I am willing to bet that if you really wanted to pursue your nursing career, you could get away with it in another state, or another country if it came down to it. Before jumping the gun on anything, consult a lawyer familiar with these types of cases. This is nursing; the exception to the rule. You are a new grad. What you are currently experiencing is expected. Pass the test of time and work for your respect. If you have the money, you can screw the rules and go for red bottoms. Who cares if you "lose those skills." You don't need those skills for your easy job. And why would you give up such an easy job to do floor nursing? I call these #firstworldproblems If you eventually move over to floor nursing, you'll have orientation and some time to brush up. No reason not to take a cushy job right now. Enjoy the easy job. Enjoy the money flowing in. Enjoy going home at the end of the day and not collapsing upon entering your place. Wait until you get it expunged and save yourself from the hassle of dealing with your state's BON. Which one is it? I'll make it easier on you; is she on instagram? All is fair in love and war... and job interviews Think this one through. If there is a complaint against your license, you should find a job ASAP before the complaint surfaces. If the employer has spent time and money orienting / training you, they aren't going to let you go over a minor complaint that surfaces later. And under what circumstances would this employer learn about said complain? 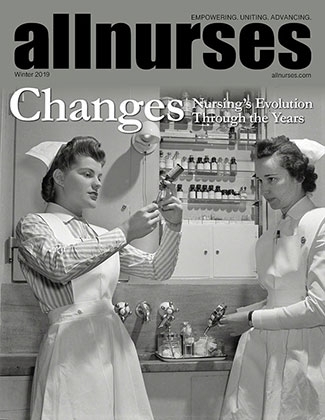 I've been reading a lot on this site recently and a lot of nurses seem to have gotten into this habit of offering more information than they need to. RN currently on Probation with the BRN. Got a write up at work! And what if you don't report it? My money is on the employer not reporting this incident to the BON. Meaning that you are the only one who can shoot yourself here. Either way, your license, your choice. I am not suggesting anything here other than for you to perform a full assessment of this situation. Starting out, things I should know, what to do and NOT to do, how to survive, and etc. I've found they go on sale right when the weather starts to take a turn for the worse. If the OP waits until November / December, it will be a buyer's market.